Coke and Pepsi have been rivals as long as both brands have existed. In this clever ad, a security camera footage captures a Coke deliveryman trying to sample the competitor's product, with disastrous results. Never underestimate the power of subtle comedy in marketing--it works every time. This commercial has it all--a cute kid, Star Wars, and a surprise ending. A child dressed up in a Darth Vader costume is shown trying to use the force on all of the every day objects in their home. Papa arrives with his new remote start Passat to help make the magic happen. Several statistics place this as not just Volkswagen's most often-watched and successful ad ever, but the most "shared" commercial of all time--well worth its $6 million price tag (yes, if you're counting, that's approximately one million dollars per second). We love a good meaningful commercial and with over 100 million viewers (arguably many, if not most of them, men) Dove hit their target audience square in the feels with this one. Sure, it is Dove's attempt to sell manly body wash and skincare products but it's so not about that--it's about all the things that make good men and give them real strength--vulnerability, kindness, nurturing, and love. We might have cried at this one...just a little. #4 WENDY'S: WHERE'S THE BEEF? If you were born before 1980, you will likely remember this commercial. In fact, you can still say to someone over 30 these days, "Where's the beef?" and they will know exactly what you're referencing. Rarely has a commercial catchphrase made its way so deeply into the cultural lexicon--but this one did. So, what made it so great? It's just catchy, really, but the old ladies are pretty charistmatic and cute, too. Wendy's was always fighting an uphill battle differentiating itself from McDonald's and Burger King and this was extremely effective. Doritos has been buying Super Bowl ad spots for years, so it was hard to choose just one but this was our favorite. In a charming reversal of the cliche of an overprotective father, the son of a single mother protects both his snacks and his territory from an interloper. If you're ever struggling to market something in an inventive or unique way, try taking a well-worn story and make it new by turning it on its head with a role reversal or funny twist. The effectiveness of this ad spot ran so deep that the first Google search result for "Terry Tate" yields "What NFL team did Terry Tate play for?" The answer is, well, none. He was played by actor and football player Lester Speight when the spot debuted in 2002. The plain fact is that it's just funny--so funny that it spawned a mini-web series that ran for six episodes. Terry is hired by the bosses at faux agency Felcher & Sons to help increase productivity by tackling anyone who isn't doing their job right, being lazy, or generally wasting office resources. E*trade has lots of Super Bowl spots to choose from and we deliberately chose not to highlight the talking baby series, even though it's the more memorable. This particular ad actually has a stronger approach. We remember the baby from the other ads but no idea what their message was. This one is so basic that it's actually kind of stupid, and frankly, that's the point. We won't ruin the ending for you. Sometimes simplicity is the best approach to bring the message home. MINI is genius with advertising. They nail it across platforms--not just on commercials but also in print ads, on billboards, and on social media. They wisely play on the stereotypes of their company and spin them to fit their disruptive brand image. With some famous faces, they make both a funny and poignant statement about defying labels that they then also translated into a successful social media campaign for further brand engagement. In its most effective ad campaign ever, Monster.com made waves by having children discuss their hopes and dreams of future employment. But instead of lauded careers like being a firefighter or the first female president, these kids say things like, "I want to be a middle manager." It's both ingenious, sobering, and even funny, which is a very tough balance to strike with an ad campaign. No doubt it made all the adults in the room pause and ask themselves, "Am I doing what I really want to do in life?" In a fast-moving series of portraits and qualities, Axe no doubt gained some new fans with this homage to the everyman. Yes, the Super Bowl is a good day to reach some macho men, but we doubt most dudes sitting at home have six-pack abs so this lead is, in our opinion, a pretty brilliant way to appeal to the masculine masses. Even if Axe might be an overwhelming scent in real life, they have nailed something cool and artful here. We realized that no list of Super Bowl ads would really be complete without a Budweiser commercial. So here's our favorite. It's the ultimate win: the triumph of the underdog. WHATEVER RESULTS SUNDAY'S COMPETITION BRINGS, THE SUPER BOWL IN ALL ITS GLORY IS STILL AN EVENT. ULTIMATELY, IT'S NO DIFFERENT FROM YOUR EVENT. DO YOU HAVE BILLIONS TO SPEND ON YOUR EVENT? PROBABLY NOT. DOES IT MAKE YOUR UPCOMING EVENT ANY LESS IMPORTANT THAN THE SUPER BOWL? DEFINITELY NOT. WE EMPATHIZE WITH WHAT IS ON THE LINE FOR YOU, FOR YOUR EVENTS, AND HOW, IN YOUR WORLD, YOUR EVENT IS JUST AS IMPORTANT AS THE SUPER BOWL. WE HOPE YOU ENJOYED THIS COMPILATION OF OUR FAVORITE COMMERCIALS. NO DOUBT THERE WILL BE A WHOLE NEW, EXCELLENT CROP OF AWESOME ADS TO WATCH AFTER SUNDAY! LEAVE US A COMMENT BELOW TO LET US KNOW IF WE'VE FORGOTTEN ONE OF YOUR FAVORITES. NO MATTER WHAT YOUR BUDGET IS, YOU CAN WOW 'EM WITH YOUR EVENT--JUST AS MUCH AS THE SUPERBOWL WOWS US ALL. 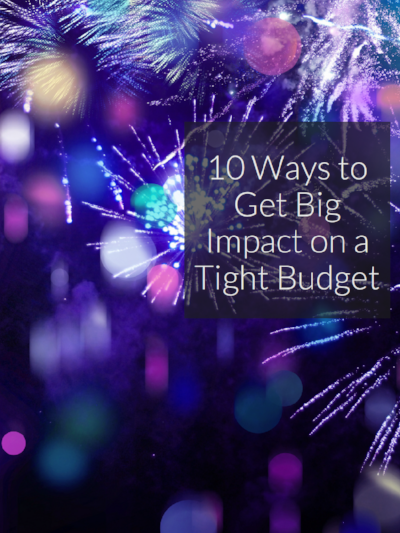 DOWNLOAD OUR CHEAT SHEET BELOW FOR OUR TOP TIPS ON HOW TO GET THE MOST BANG FOR YOUR BUCK!